May 16th since around 10pm near rue Perron in Pierrefonds (H9A 3E5). He responds to his name Max. 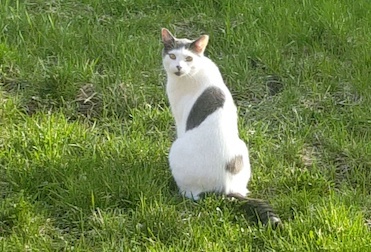 He has a grey tail, 2 grey patches on his body, a perfectly grey chin, a grey head (but white face) and 3 black spots on his nose. The rest of him is white. He does not have a collar on him. Please please please help me find him. Contact: Priyanka Chauhan à priyanka_chauhan[at] live[dot] com or 514-944-5125 Thank you! Previous Post: Miette – found!